In the MBU Fine Arts Center at 4 p.m. on a Tuesday, the stray growl of a saxophone, the percussive thud of a drum or the dominant punch of a trombone may be heard echoing down the halls and filling the rotunda with sound. After hours of rehearsal and preparation, the initial wrong rhythms and notes from an unfamiliar piece give way as a perfected musical tune takes a life of its own. 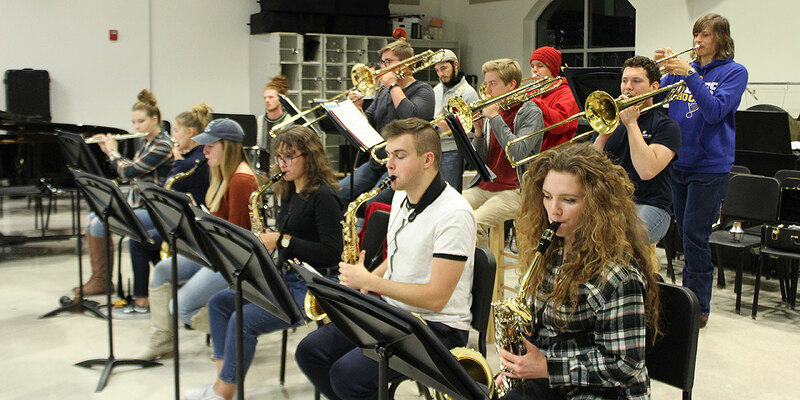 According to Shane Williams, associate professor of music and director of the MBU Jazz Band, the students behind those sounds have created a bond between each other through a love for what they do, and now they are ready to make some noise. The MBU Jazz Band is a group consisting of students from a wide array of backgrounds and majors gathering with the common purpose of having fun, playing jazz music and glorifying Christ. Williams began directing the MBU Jazz Band in 2015 and took initiative to build a program that would yield the greatest benefits for students in the future. The MBU Jazz Band had seven members on its roster last year at its peak enrollment. Fifteen students compose the group this year, with freshmen and transfer students accounting for the increase in numbers for the ensemble. Emma Bushery, a freshman alto saxophone player and music education major, said that making the transition from high school to college band was vastly different from what she had previously known. “The practices were a lot different compared to my high school. It was more intense since it was two hours long, we work at a faster pace and we only meet once a week, so we have to bring our best to every rehearsal,” Bushery said. Despite the influx of new members who did not know each other before the year began, Williams said he tries to foster a sense of family. Alaura Dalgetty, a freshman flute player and early childhood education major, said she believes his plan is working. “I think we have a really good relationship as a jazz band. We don’t fight over parts, and we are fair with things. Overall I feel like it’s a family feeling rather than 70 other people being there,” said Dalgetty. The jazz band extends its sense of family beyond the typical instruments found in a jazz band; both Dalgetty and freshman Sarah Baumann play the flute. Dalgetty had never played jazz music before joining MBU’s jazz band, so she said learning to play a different style of music was difficult at first, but she’s learned to embrace it. “Coming in not knowing how to play was a little intimidating but with hard work you can pretty well pick up on the differences pretty easily,” Dalgetty said. Gabriel Landrigan, a junior trombone player who is majoring in business administration, said he believes another characteristic the MBU Jazz Band possesses is a demonstration of humility among the members. Bushery echoes similar sentiments in her thoughts on the attitude of the band members. “I don’t think there’s that much pride going on. I think we all know each other and we know what’s going on in each other’s lives … so we don’t compare ourselves to each other,” Bushery said. Spencer Toft, a sophomore trombone player who is returning to the band from last year, said he believes this attitude has a positive effect on the group’s sound. “In our group there’s not very many selfish players. We all share solos and we all are good enough to know what it means to blend. We play with the sound of a group rather than the sound of a group of individuals,” said Toft, a music education major. 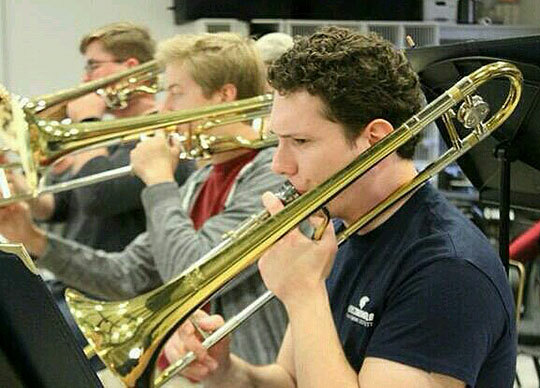 Gabriel Landrigan plays trombone during a recent rehearsal of the MBU Jazz Band. 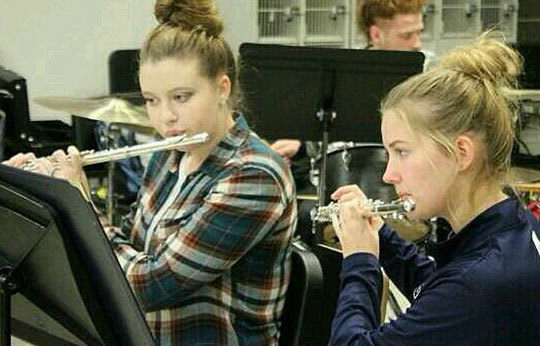 Left to right, Alaura Dalgetty and Sarah Baumann play flute during a recent rehearsal of the MBU Jazz Band. Being a veteran member, Toft has the benefit of seeing the similarities and differences from last year’s band to this year’s group. Those ideas and opportunities coupled with the hard work lead to large payoffs and great satisfaction, according to Bushery. “I think the end result is really satisfying. Just being on that stage and playing all that I’ve practiced … and just being able to show what I have. I don’t really have to worry about playing everything perfect because I know I’ve practiced it all, and I just have to enjoy being up there, and I think that finishing after that and hearing the applause is really fun,” Bushery said. For Landrigan, fellowship and growing together spiritually and relationally with other members of the jazz band are what he gains most from playing in the ensemble. Since the MBU Jazz Band is representing a Christian university, one of its main goals is to glorify God and make Him known through its work. Dalgetty said the gifts the members possess to make music can be an inspiration and bring glory to the Lord. “We are able to use the gifts that God gave us to show people what we’re capable of. Our gifts are shining when we’re up on that stage. I think a really big thing about band is we use what we got from God to inspire others,” Dalgetty said. Williams, who pushes for the product of the MBU Jazz Band to be nothing short of excellence, said he believes this is how the band not only brings glory to God, but exemplifies the values of MBU. “The first thing that is probably most apparent to believers and non-believers [about the band] is excellence, and God is a god of excellence. If you go look in 2 Chronicles it talks about those that played worship and it said that young and old alike, they were skilled, and so I think that excellence comes from being skilled in what we need to do,” Williams said. Additionally, Williams said faithfulness will naturally lead to showing others Christ through actions instead of words. As the holidays approach, the MBU Jazz Band’s schedule ramps up as it will be performing at events around campus. On Tuesday, Nov. 27, the band will be playing in the Perk at the Hanging of the Green following the outdoor festivities, and on Friday, Dec. 7, the MBU Jazz Band will be playing a private show for donors in the Mabee Great Hall preceding the MBU Fine Arts Christmas Concert. Additionally, Williams plans to take the band on a local tour in the spring to various high schools to showcase the group and recruit new members. Williams said he believes there is great potential for the group and an excitement in the members to demonstrate their skills and use their gifts to glorify God. “I think for those who have been in a smaller group it’s incredible excitement because now we’ve [gone] full, and for those that are new I think it’s excitement for them because we’ve got some players now,” Williams said. Williams’ vision has cultivated the atmosphere he desires to create: one of a family. Dylan White is a staff journalist for MBU Timeline. White is a broadcast media major with a journalism minor. He is a member of the MBU Jazz, Concert and Pep bands, and he works in MBU’s Records Office. After graduating, White plans to pursue a career in radio and news.